After a bit of puttying and sanding (I detest sanding! ), I've brushed on a primer coat. 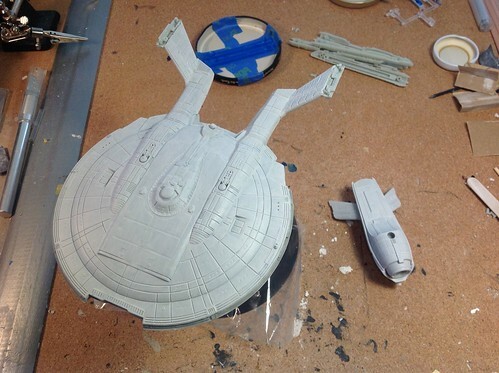 I'll need to retouch later after I glue the saucer halves together, but I'd prefer to have it at least primed now. 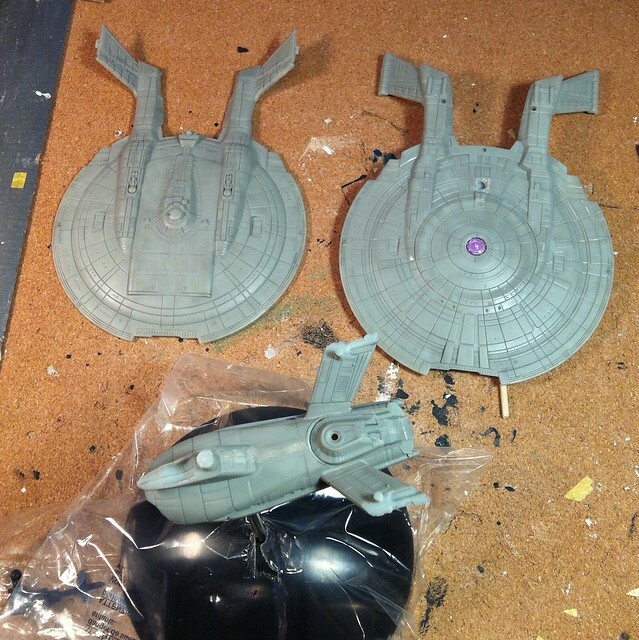 In the meantime, I've worked on the larger clear parts: the deflector dish backing and the impulse exhausts. 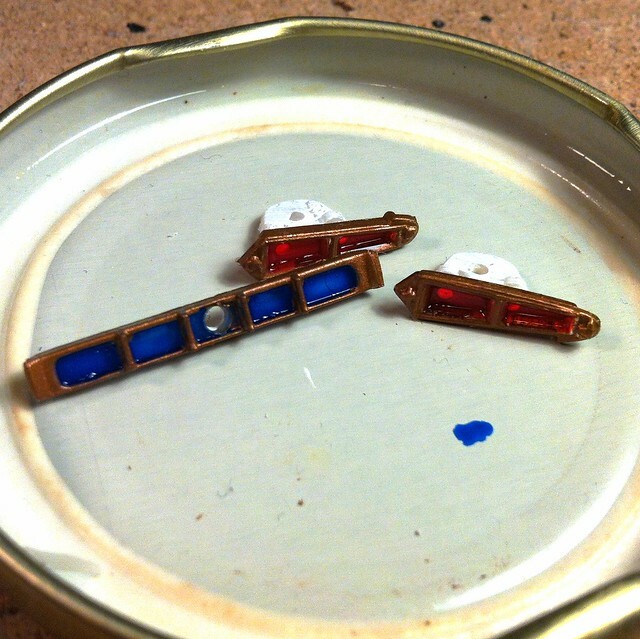 Maybe I'm overusing the bronze highlights, but I really like how it looks against blue, red, and hull white. This looking good. I have the regular release but I am going to have to pick up this kit. 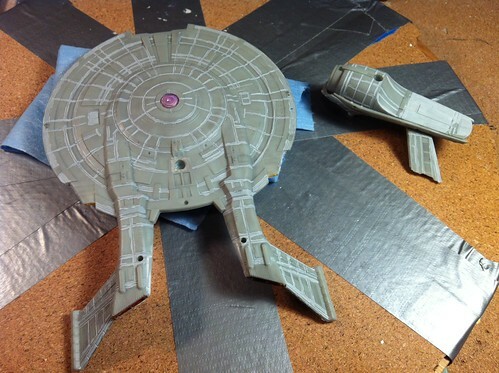 I glued the saucer halves together. There were some disappointing gaps in the tail booms, but otherwise it's a decent fit. And in the next picture, I've finished putting and sanding the saucer and now I'm painting lowlights into the panel grooves. Yes, LOWlights. It's moments like this when I wonder if I really know what I'm doing. The answer is almost certainly "no". I'm just making it up as I go along. The great thing about doing a non-canon ship from a kit is that I really can make up any paint scheme I like. I'm enjoying not having to pore over reference photos this time. Low-lights. Interesting. I can't wait to see how this comes out. I may steal it for adding detail to my Wizkids starships. I can see it working well on the ENT-D. They're only lowlights in comparison with the light grey that I'll use as the base coat. This isn't going to look like the show. I don't think it should. Quick update: I haven't made any progress due to other things going on that keep me from painting. Hoping to get back to it eventually. So my technique for pre-painting lowlights into the panel lines like I did for my previous three models really really won't work here. It's just too darned small! That's a shame, because I spent quite a bit of effort on that. But this is also a learning experience. It's my smallest model so far. 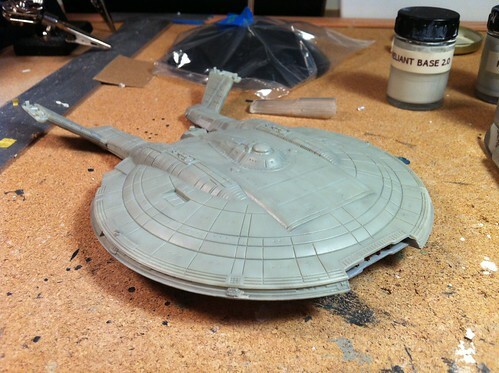 So as of today, I painted over everything with only two coats of the base colour, which is exactly the same as my Reliant and NCC-1701 refit. I expect I'll have to learn how to do a wash for those panel lines at the end. Learning! oh! Too bad about that. Pin wash time? Looking good! what grey do you use? ironman150 wrote: oh! Too bad about that. Pin wash time? Looking good! what grey do you use? I have no idea what a pin wash is, but it sounds like it might hurt. I mix my own greys — four shades from a very light grey base to a very dark grey for small details. I'd do more, but I'm cheap and lazy. 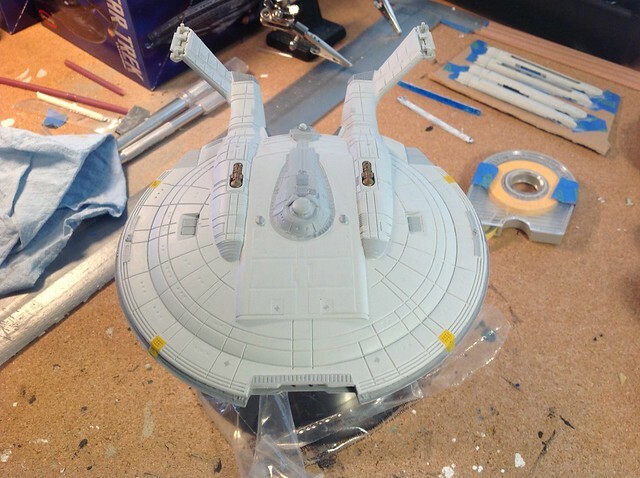 I'm now layering up the details on the top of the saucer section. I think I may have put too many layers on the bridge superstructure — it's kind of globbing up and losing detail now. It's weird not seeing the panel lines yet. I just have to trust that I won't totally ruin everything when I add them at the end.